Ok well what should i look for when it crashes so i don't post repeats? I meant because I'm fixing all the crashes you're posting, you end up finding novel ways to break things each time. Definitely post all your crashes. actually i can see you needing more for some advanced complex bots, especially when you get into some multibots. They take units in whatever forms a full circle (as of this moment, that'd be 1080), and convert them in to degrees (so in this case, divide the values by 3), then run sin/cos on them. Normally the results of sin and cos are in the range [-1, 1], but they get scaled so it's easier to make use of them, up to [-1080, 1080]. So for example, 90 degrees would be 360 units in Sunweaver. 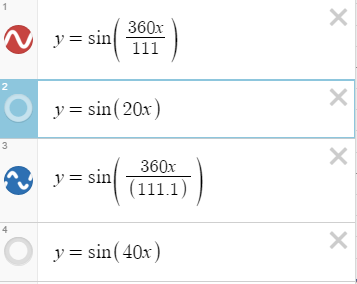 Sine of 90 degrees is 1.0, so 360 sin would return 1080. Sometimes it bugs out and you have to uncomment the line and recomment it to make it work. If you can figure out under which circumstances it bugs out that would be good. It's possible it's a bug in the program that I should fix. Mine is more concise though! I think it was when I was fiddling with the number on the last line that is now 30, I can't seem to reproduce it now unfortunately. I like the idea of using multiples for memory range, basing it from days in year aka about 360 is not a bad idea. However, we need to consider what other values stuff will return and incorporate the prime numbers from these into it. That is why I prefer to go with large ranges with stuff like this. In my experiments I always go with longs actually even though I do not need them.